Always seek permission before entering any private cemetery. From the Baldwin County Courthouse, go west on Hancock Street for 2 blocks or 0.2 mile (or the one large block containing Georgia College & State Univ.). Turn right on Clarke Street. Go one large block or 0.2 mile. Turn left onto Business Highway 441 North (Montgomery St.) and follow the signs for Business 441 N (turn right on North Columbia St.). Go approximately 7-1/2 miles. Turn left at Meriwether Rd. After 2.8 miles (about 2 blocks past Georgia Power overhead lines) you will come to the big curve to the left, where Forte Dr and Meriwether Lane meet Meriwether Rd. Continue on Meriwether Road for 0.4 mile (south). 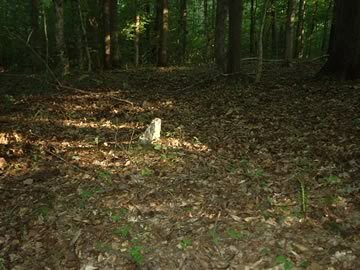 The cemetery is located on your right (west) 100 yards into the woods and sits on a slight rise. Easiest access can be obtained by seeking permission from the landowners. The name for this cemetery was gotten from the DOT map. 73 identifiable graves. The cemetery could contain as many as 200 graves.